The Conservators of the Bodleian work to preserve the holdings of the library, and to ensure that they are available to researchers in our reading rooms, and to the public through exhibitions. Although the department officially came into being only in 1978 with the appointment of Michael Turner as the first Head of Conservation, our collection care activities date back long before that. Anthony Wood dried out the Dodsworth collection, which was wet when it arrived at the library, on the roof of the picture gallery in 1673! Bodley’s Librarian E.W.B. Nicholson attended what is now widely regarded as the first Conservation conference in St. Gallen in 1898, returning with new ideas for paper repair techniques. During the 1970s and ‘80s the department set down strong roots under the leadership of two great names in Conservation; Judy Segal and Chris Clarkson, and developed new repair methods as well as innovations in preservation such as the fasciculing process, modular foam book supports, and archival boxes. Today, the department is made up of 25 people working in several teams: Book and Paper Conservation, Exhibitions, Preventive and Technical Support. Our remit is to protect the collections of the Bodleian Libraries, both by improving handling and storage of the collections to minimize future damage, and by repairing and stabilizing items that have already deteriorated. Prevention of damage is achieved by improving handling, environmental monitoring, and making protective enclosures for vulnerable books. The Exhibitions team ensure the safe transport and display of our collections for exhibitions both within the library and at museums and libraries around the world. They specify mounts, organize insurance and customs procedures, and then pack, travel with, and install our treasures, making them available to a wide audience. The Book and Paper Conservation teams carry out repair of the items in our collections to ensure that they are safe to consult or display. Repair can be very minor – such as repairing a single tear in a leaf of a printed book to prevent further damage or loss – or more involved – such as the complete repair and rebinding of an illuminated parchment manuscript, or the consolidation of friable pigments in a painted miniature. We work to ethical standards agreed by our professional body, the Institute of Conservation, by whom many of our conservators are professionally accredited. 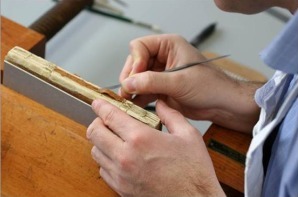 These standards require rigorous examination of our treatments in terms of quality of materials, safety of techniques, and whether the treatment respects the historic integrity of the object. We do not “restore” our collections in order to make them look like new, but we “conserve” them, enabling access for researchers whilst retaining evidence of their original structure.